Free international roaming with simplecall App!! simplecall app is available both for Android and iPhone now, which is free. Download simplecall app and get a free Local Direct Inward Dialling (DID) number and enjoy free international roaming all over the world. You can also manage your simplecall account using the simplecall app much more easily and efficiently now. Use simplecall and enjoy the liberty in your fingertips! Step-1: Download simplecall app from google play store or from apple app store. Step-2: Sign up for simplecall and during the registration process you would be offered an UK Direct Inward Dialling (DID) number. Step-3: Add call credit to your account. 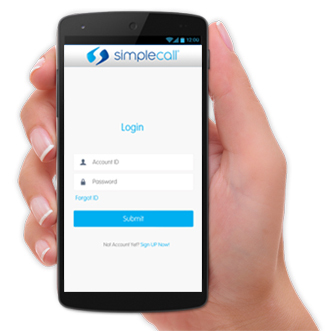 Step-4: If you are an existing user of simplecall, then after downloading the simplecall app, please sign in using your account login detail and order your free UK Direct Inward Dialling (DID) number. Step-5: Enjoy international roaming using the simplecall DID and premium quality simplecall service for A-Z destinations in the world.